1 Who needs a fast shutter speed camera? Shutter speed is of vital importance when trying to get the optimum image from whatever camera you happen to be using. That great picture you’ve just taken is a mixture of shutter speed, aperture and ISO. For those of us who want to take images of fast moving subjects whilst maintaining perfect clarity a high shutter speed is a must. Who needs a fast shutter speed camera? Professional sports and nature photographers use fast shutter speed cameras all the time to get their images razor sharp and, of course, they manually control the other components of their photographs to get the best quality images. If you want to take shots of things such as sports action or birds and insects in flight then a fast shutter speed is an indispensable part of your arsenal. This can become tricky when you encounter low light situations like that bird you want to capture but which is flying in the shade or the sports action that’s happening on a dull day out of the direct light. In situations like these then you have to start using a higher ISO, in conjunction with a wider aperture (low f number) to maintain the ability to use a higher shutter speed. For most DSLR cameras, even the entry level models, this is not a problem as performance at an ISO of up to 1600 or even 3200 results in decent quality images with a minimum of graininess, which is one side-effect of higher ISO’s. For those of us who can’t stretch to spending the kind of money needed for a DSLR camera and all its associated equipment then we have to think about how can we get the best performance from a simpler and more easily utilized piece of equipment. This is now eminently achievable given the advances made in recent years in compact camera technology and the drive to distinguish them from the upper range of smart phone cameras which have also improved dramatically in the recent past. Here I shall review a few of the better compact cameras on the market which combine decent image quality at higher ISO’s and which also allow you to set your own shutter speed and aperture. Some of the cheaper point and shoot cameras rely solely on automated ‘factory settings’ which, to be honest, are rarely reliable often leading to badly exposed shots which can be tricky to save even when using editing software. With that in mind we’ll take a look at some of those compacts which allow manual control over shutter, aperture, ISO and white balance. The Panasonic FZ200 is a great all-round compact camera and scores highly in its class in cameras for sports photography. It has the usual compact camera 28sq mm sensor and has a resolution of 12mp which isn’t the best but is adequate for most non-professional needs. With a maximum shutter speed of 1/4000th of a second it matches most entry level DSLR’s in this respect and also allows for shooting in bursts (continuous shooting) at up to 12 frames per second so you can take lots of shots in rapid succession. This allied to keeping it in continuous auto focus means you should get those action shots in focus. Shooting with a maximum aperture of f.2.8 means you can use a fast shutter speed with a low ISO which is more than adequate for most sports or nature photography and the FZ200 also has a great zoom facility and a built in optical stabilizer so close up shots should remain sharp. It also has a relatively long battery life at around 540 shots so it shouldn’t die on you just at the crucial moment. The 3 inch LCD screen is articulated which gives you greater control over high-angle shots or selfies and the camera enables you to shoot in RAW format if desired which gives greater control when it comes to editing your shots later. As far as ISO performance is concerned the FZ200 does very well up to an ISO of 800 with little discernible noise but at 1600 it begins to become noticeable and 3200 or 6400 should really be avoided of possible but taking it up to 800 should cover most eventualities when covering sporting events or any daytime nature shots you’re looking for. Overall this is a camera which offers fast shutter speeds, good ISO performance, manual control over your shots and comes highly recommended for fast shutter speed photography. It is though a ‘bridge’ camera which means it’s somewhere between a genuine compact camera and a DSLR so it features a DSLR type body and it isn’t the thing to slip into a pocket before you head out to the game. Overall though as far as performance goes not a bad choice for sports photography and performs well in other areas too such as portraits and landscape. 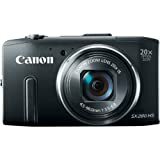 The Canon Powershot SX280 is another good all-round compact camera, and this time it is a genuine compact so it slips easily into a pocket or purse, but still offers good performance. It features the usual 28 sq mm sensor at 12.1 megapixels found in most compacts but image quality is still good. For use with high shutter speeds the SX280 performs rather well. In addition to a fastest shutter speed of 1/3200 it has a usable ISO range of 100- 1600 so you should be able to use a fast shutter to cover most eventualities and should certainly be able to get sharp, well-focused images with the action ‘frozen’ without any problems, although the 3200 and 6400 options are best avoided. It has a 20x zoom with optical image stabilizer so even at max zoom the results should be clear and sharp. It features full manual control over all settings and also the usual auto options for those who really do just want to point and shoot. Unlike the Panasonic (above) it also has a Wi-fi function although this can drain the already not-too-impresive battery life so be careful when using this. With no touchscreen option the design is reasonably friendly as all the controls are placed to the right of the the 3 inch LCD screen leaving everything at your fingertips. As far as video is concerned the Canon offers full HD video capability at 60fps for up to 30 minutes and also has a super slow motion video which goes up to 30 secs which may or may not be useful when shooting sports. Overall performance on the SX280 compares favorably with other cameras in its class and the reasonably good ISO performance and shutter capability of 1/3200 make this a good investment for those interested in sports and other fast shutter speed photography although maybe not as versatile as the Panasonic FZ200. As befits a compact camera with this kind of price tag the RX100 is a superb back-up for DSLR users and has many features not found on other compact cameras. Chief among these is the fact that it has a much larger sensor than most other compacts (13.2mm x 8.8mm) and a pixel count of 20.1mp. This sensor has on-sensor detection points which help keep the vast majority of shots in focus when tracking a moving subject which makes it perfect for sports and action photography. It also has a Zeiss Vario-sonnar lens, maximum aperture of f1.8 and a maximum shutter speed of 1/32000. The RX100 has a retractable electronic viewfinder which can be used when the 3 inch, tilting LCD isn’t adequate. On top of this it supports shooting RAW format, full manual control, built-in pop-up flash, built-in ND filter and Wi-fi connectivity. With its widest aperture down at f1.8 and fast shutter speed it’s a fantastic sports and action camera and also functions well at higher ISO’s with no appreciable problems as high as 3200. It has a lot of the features you’d find on any entry or mid-level DSLR including full manual mode, shutter priority and aperture priority. It can shoot ultra HD video at 30fps for up to 5 minutes, HD video at up to 960fps for slow motion and has a fast tracking system for use during video shooting. There are many more features that we don’t have time to go into here but as befits a higher price camera the RX100 is superb for action/sports photography and video – probably the best compact camera for this kind of photography on the market. At the other end of the price scale we find the Nikon Coolpix A300. This latest release from Nikon is good enough for the point and shoot enthusiast but not great for those want to take crisp, sharp action shots. As usual you get what you pay for. With a shutter speed of max 1/1500 and an ISO range from 80 to 1600 I wouldn’t want to use this at an ISO of over 400 so definitely not the best for poor light when taking action shots. It has a sensor of 28sq mm (the usual for most compacts) at a fairly impressive 20mp and has a 8x optical zoom coupled with a 4x digital zoom (not recommended as digital zoom is equivalent to cropping and leads to grainy/blurry photos). Using optical zoom in good light should get decent results but the maximum aperture is f3.7 meaning it’s a bit restricted when taking into consideration the ISO. It does feature a subject tracking mode though amongst its AF modes. The A300 does have all the functionality you would expect on a small compact camera and is good enough for the money you pay but I wouldn’t rely on it for action/sports photography although it should function well enough in good light. Easy to use with intuitive controls the A300 does what it says and not a lot more although it has some built-in editing tools (some a bit gimmicky). Good little point and shoot camera, value for money, but not a replacement for a DSLR or something you want to rely on for crystal clear, sharp action pictures. As is always the case, you get what you pay for with any item of technology and cameras are no different. With respect to the cameras reviewed above both the Panasonic FZ200 and the Canon Powershot SX280 HS are mid-priced, decent quality cameras with a good amount of control over the images you can take and certainly good enough for capturing usable sports and action shots. The Sony Cyber-shot DSC-RX100 V is without doubt the best of the four but also comes at a hefty price, whereas the Nikon Coolpix A300 is a much more basic model and may not perform to the standards required for high shutter speed photography. The choice is up to you of course but I would say it’s definitely worth paying a little extra for the Panasonic or Canon if you want to be assured of getting some good shots and if you really want the best out there for high shutter speed, low light, high spec technology then opt for the Sony. If all you want are some decent shots of you snowboarding or skateboarding then a cheaper camera will probably give you some usable images at the extremes of their performance range.